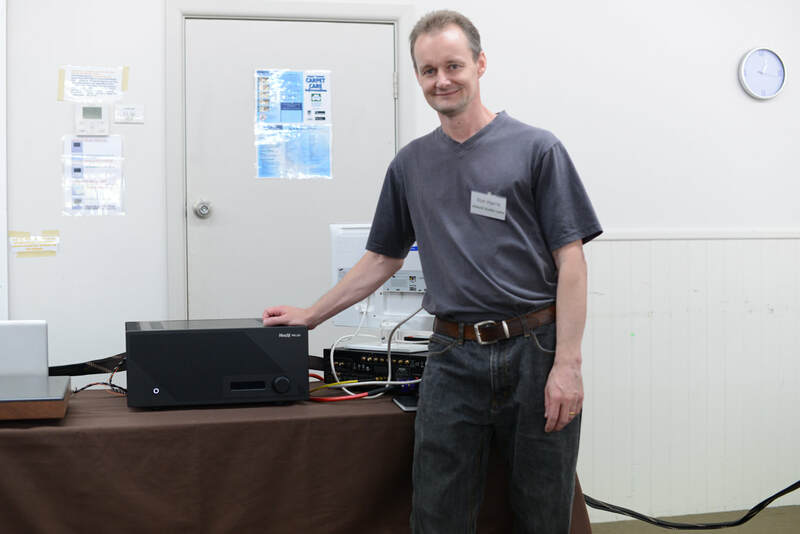 For our November club meeting we are very pleased to have Mike Lenehan of Lenehan Audio return after quite a few years. Mike last presented to the club back in March 2012…!! He’s been keen to come back but he was just too busy to return earlier! Busy is good – his business is thriving. Anyone that knows Mike will know he is meticulous in his designs and build – he won’t release a product until the design is perfect and the product is of very high quality. And yet somehow he still finds the time to be very active and helpful in forums. He is a great Aussie talent and we’re happy to have him back. 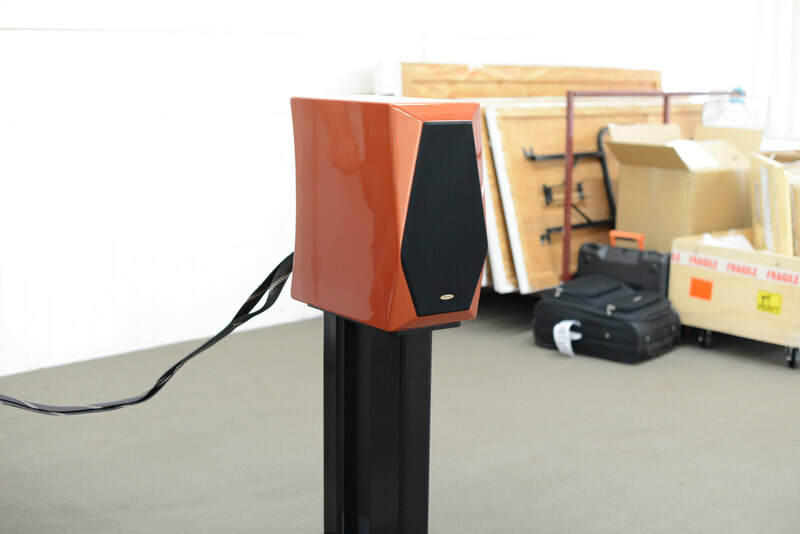 Lenehan ML2 Reference speakers with dedicated stands. Refer to http://www.lenehanaudio.com.au/ml2-ref.html. “The ML2 is the next generation of high-end two way monitors from Lenehan Audio. Designed for absolute no compromise music systems.” Uses Dueland caps and resistors in cross-over (also sold separately through his website). 35 - 25Khz +/- 1.5db response in room. 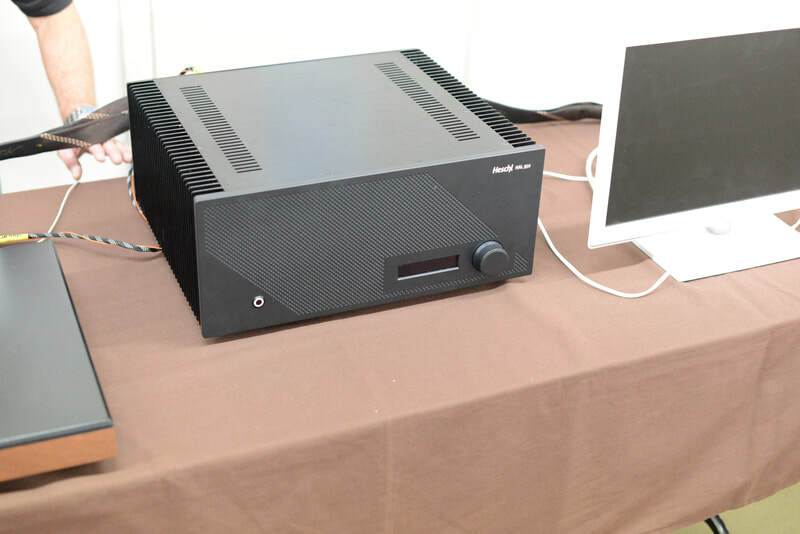 Heschl Audio Labs integrated amp. Don’t bother Googling this one… it’s so new that there’s nothing to be found! The good news is that it’s Aussie, well designed and built … and 300wpc. Designed and built by Ron Harris. FoilFlex interconnects and loudspeaker cables. These are new cables designed by Lenehan Audio. Isolation platforms for the electronics. Also designed by Lenehan Audio. 3Hz Isolation platforms for the speakers. Also designed by Lenehan Audio. Curious USB cable. Famous giant-killer USB cable sold by Lenehan Audio. Made by Rob Woodland in Queensland. Mike’s source for his presentation will be his laptop with the Audirvana Plus music player. Our source for our BYO session will be an Oppo BDP-105D multi-format player. The second half of the music sessions will be our popular BYO. Members and guests are welcome to offer music to share with us all. So bring along your favourite music on CD or USB thumb/flash drives (sorry, no vinyl this month). All we ask is that the music and recordings be interesting. We'll ask you to tell us a little about the artist/recording before it is played. Tracks over 6 minutes will be faded out, to give everyone a fair go. ​Our November meeting was well attended. It was a fun day with lots of good food, good music, a superb system and great company. We had lots of people indulging in the BBQ (as did I! ), and things were really humming by around 1:30. At 2:00 we managed to get most people into the room for our AGM. Again, this was a short affair whereby George dissolved the committee and then read out all the nominations for the Committee roles. All were voted in collectively. Our bank financial statement for the year ending June 30th 2018 was also approved. For the record, the Committee has Andrew Baldwin (no official title), David Minarik as our Public Officer, George Davidson as Vice- President, Keith Morris as Treasurer, Stephanos Eliades as Secretary, Steven Polley as Events Coordinator, Paul Bryant as Technical Advisor (and Facebook support) and Tom Waters as President. We are also ably supported by Ray Eade who looks after our website. I then introduced our main presenter for the day. Mike Lenehan really needs little introduction – he’s well known and respected in the industry, and well known to members and guests alike. Mike brought in his ML2 Reference speakers. 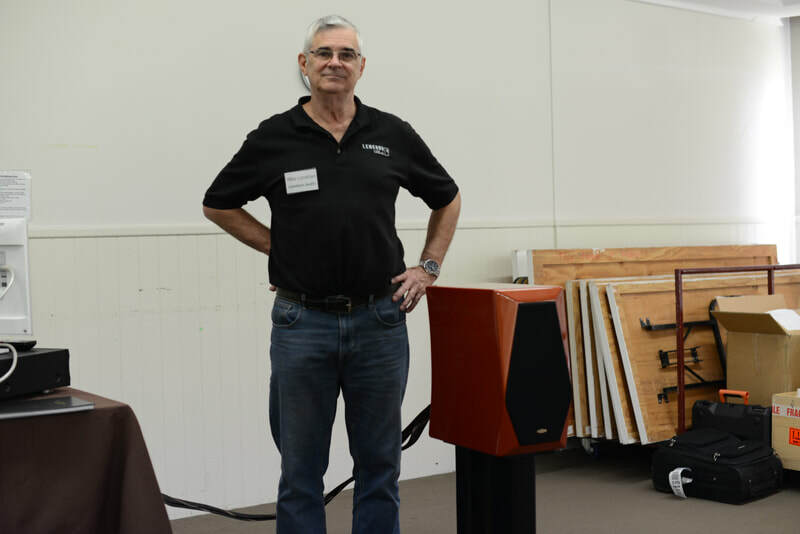 His speakers weighed in at 32Kgs each, and each stand was 54Kgs. 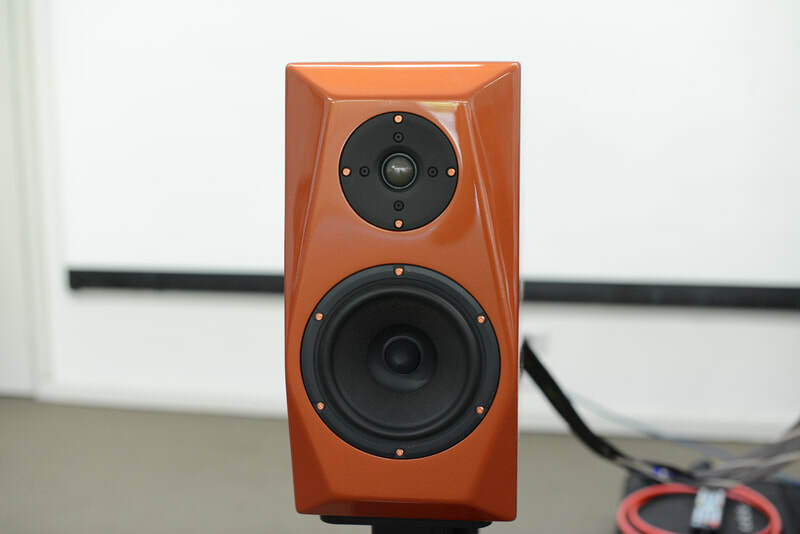 The speakers were a gorgeous burnt orange colour (well, I liked them if no one else did!) in an automotive paint finish. The ML2 Reference are not huge stand mount speakers, but were quite capable of driving considerable volume into the room. Their power handling is very high, and the Heschl Audio integrated amplifier was happy to oblige with loads of power and current. It delivered 350 wpc into 8ohms, 600 wpc into 4ohms. The amp was 45Kgs or so in weight – heavy but not overly so, nevertheless it certainly delivered in sound quality. We were fortunate to have the designer, Rod Harris, attend the meeting. Both Mike and Rod gave talks about their products, and there were heaps of questions for both. Mike also conducted some A-B-A comparisons where he played music with his Macbook sitting on the table top, and then sitting on the 3Hz Isolation platform. From the back of the room, I thought Dean Martin’s voice sounded better on the isolation platform. It didn’t hit you in the face, but I thought the midrange became more clear and open and the spittle on Dean’s lips seemed more apparent when he sang. Many noted that the bass seemed a bit tighter. Mike said that these devices are considerably more effective under the speakers (he’s tried it). The problem is that they are too unstable with the weight and height of speakers on them. He’s working on a version for speakers that can be safely marketed (read ... less tipsy!). I thought the ML2 Reference speakers driven by Rod’s amp sounded very good in our tricky room. Unfortunately though, when we had our BYO session we couldn’t get the built-in DAC in the integrated amp to lock onto the Oppo. We weren’t sure where to level the blame for that because we didn’t have the time to pursue it further. So instead of using the Oppo as just a transport, we had to use it with its analog outputs into the integrated amp – the sound quality suffered as a consequence. The sound was much better through Mike's Macbook running Audirvana with a Curious USB cable link (also sold by Mike) into the DAC section of the integrated amp. Mike’s music presentation was universally considered better. Here is some feedback lifted from our Feedback forms….